Opito Bay is one of the most picturesque beaches on the Coromandel Peninsula. A beautiful sandy beach for safe swimming, diving, fishing and boating. 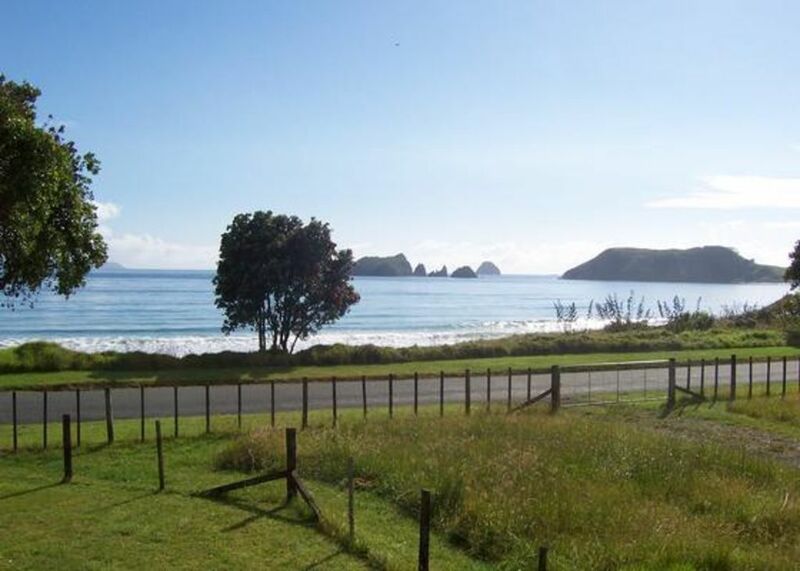 This comfortable waterfront holiday home is just perfect for two families.
. Opito Bay is one of the most picturesque beaches on the Coromandel Peninsula. A beautiful sandy beach for safe swimming, diving, fishing and boating. This comfortable waterfront holiday home is just perfect for two families with excellent privacy offered by the two separate dwellings. Perfectly positioned in a tranquil spot with gorgeous views of Opito Bay and Mercury Islands from the living areas and decks and only metres to the stunning beach just in front of you over the road. Accommodation offered includes the three bedroom main house plus extra accommodation (two semi-open-plan bedrooms, bathroom and deck) above the garage at the rear. Fully equipped with all the modern conveniences, books, games and puzzles. There are a number of lovely walks to neighbouring Crayfish Bay, Matapaua Bay and along the relatively deserted western end of the Bay where there are no baches. Perfect for peaceful family holidays. Half an hour north/east of Whitianga and Coromandel townships. Two night minimum stay (or more during peak periods) Tariffs may be higher than listed for peak season periods, large groups, school holidays andamp; long weekends. Must BYO Sky Digital decoder for Sky. Free to air TV is available. REFUND POLICY - While the standard refund policy for this property is no refunds, partial or sometimes up to full refund (less booking fees) may be made at the owners discretion if a replacement booking is made without loss of rent. Have loved staying at Opito for over 25 year and like to share this beautiful place with others. The Bach would be better if it were maintained. It also needs a deep clean. I have ordered an additional Spring Clean for the bach. Paul was great to deal with, and his house is a lovely place to stay. Unfortunatly we didnt get to stay. Reason being it was double booked. Such a shame as its location gives it stunning views of the bay. Paul how ever had us sorted in 20mins in a great place just down the rd. Also has given us two nights for free in the future. A great Kiwi Bach. Heaps of room for extended family. Views to die for. We had a very relaxing time. Loved waking up and sitting on the deck in the sun, coffee in hand, soaking in the amazing sea views. Even managed a few quick dips, kayaking, paddleboarding. Not bad for September. Would definitely love to go again.